Even while putting all your hunting knowledge together it can be difficult to avoid the sharp senses of a whitetail deer. We use everything from sport washes and cover scents to charcoal suits and UV reducing agents. Now we wont say throw caution to the wind and forget those things but, if you consider combining some visual and audible sounds with a little scent, you can capture the deers attention and maybe, just maybe, send out the signal that all is well in this neck of the woods. Years ago we did a study behind the old log cabin with a very basic foam archery target modeled after and 8 point buck. From the front the buck looked realistic enough, from a distance, to definitely catch your eye and hopefully the attention of the local deer herd. We set up in a familiar feeding area where does and small yearlings congregated throughout the day but mainly towards the evening hours. The decoy (target), was anchored at a distance of 20 yards from two treestands and dabbled with Tinks Draw 2 attractant scent. We took to the stands and waited for 30 minutes before beginning a calling sequence using a combination doe bleat and buck in rut call from Primos. The does that soon arrived in the field seem to pay no particular attention to the decoy or the calling, and given that the season was mid-September in the northern Michigan woods, we expected them to be more concerned with feeding. Such wasn’t the case with a mediocre 6 point that had walked into the field shortly after the does. He examined the decoy from a distance while continuing to feed, seemingly sizing up the new kid on the block, until he heard the next sequence of calls. This immediately grabbed his attention as he cautiously made his way closer. The wind shifted for a moment and his nose went to the air filling his nostrils with the scent we had placed. Direct hit! The young buck began a designated path straight towards our decoy with a curious, yet still somewhat cautious, strut in his stride. Could it be that the scent had him confused? Or, unlike the does, was he ready to find out just who had invaded his territory? We’ll never know for sure. The buck walked within 15 yards of the motionless decoy and stood there, perfectly broadside to my treestand and enamored with what he was seeing. The game was over when a chickadee also found the decoy of interest and landed on its back several times tipping the little buck off that something here wasn’t kosher. But that’s hunting. In today’s market threes really little excuse for the type of presentation that we used many years ago. The targets and decoys of today’s day and age are realistic enough to fool not only deer, but also hunters, especially from a distance. We express the use of extreme caution when adhering to the use of decoys. 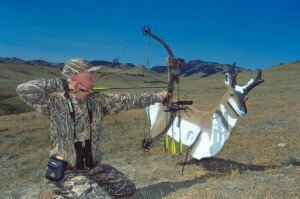 Companies such as McKenzie and Delta are leaders in the field of 3D targets and decoys with moderately priced models of all species of animals and the first choice of many hunters. A realistic 3D model can be purchased for just over $100 and will last through many years of both target practice and decoying. Your setup should consist of a highly visible area where deer have been known to travel such as corridors between feeding and bedding areas, open crop fields, food plots, or main travel routes used throughout the day. Try and situate your decoy to afford you a broadside shot especially during the archery season at a distance where you will feel comfortable. Keep in mind that most deer will stop short of the decoy regardless of how well or realistic your setup may seem and many times the deer wont be sticking around for very long. Placing your decoy 30 yards to the left or right of your stand, depending on the estimated path the deer will travel, should afford you a decent shot when the deer hangs up. You may also opt to adhere a manual or wind motivated motion device for a tail on your decoy. This doesn’t have to be anything fancy and could consist of a white rag stuck to the rump of the decoy with an ordinary thumbtack. Using a light fabric will allow the wind to make subtle twitches of the rag. You can take this one step further by running a small diameter fishing line back to your treestand to make the motion appear manually whenever needed. A word of caution when using any type of monofilament line. The line itself has a tendency to catch the suns rays and create quick streaks of light, just as it does when you cast from your boat. The line should be hidden or weaved through the brush and always remember to take the line back home with you. Never leave it in the woods even when planning to use it again the next morning or later that evening. Combining scent with your decoy makes perfect sense, no pun intended, and will bring not only the visual effect but also appeal to the deers sense of smell, which is their most effective key to survival. Your choice of scent should be dictated by the time of the year that you’re hunting and the type of decoy you’ve chosen. In our test we used a small buck decoy with a universal buck and doe scent. Because we couldn’t actually “hunt” at that time we were just looking for a reaction mainly from the herd of does we had been watching. If you use a doe decoy, try a scent like Code Blue’s Estrus Gel and for a buck decoy have a look at Code Blue’s Buck Urine Gel. The gel is easier to work with than the liquid and holds to any decoy better than the liquids. Alternatively many people opt not to apply the scent directly to their decoy especially when it’s stored in the garage back home or you cannot transport the decoy in an open-bed pickup. Trust me. Get that same decoy covered in scent, in an enclosed area, and you’ll probably be riding home with your head hanging out the window or the lady of the house will be stringing you up from the buck pole! Of course the brand you use is a personal choice but when possible use the gel formula in this situation. Early in the year, before a rut begins, you’ll probably want to use a scent that wont seem out of place like a simple urine scent. Because you wont find any does in heat or bucks in rut, the use of urine will create a more stimulating and calming effect. Early archery season and late season whitetail hunters would benefit the most with this type of scent setup. Your choice of calls is one of the last parts to bring this presentation full circle. You are already appealing to the buck visually with the decoy. You have his nose working overtime with the scent. Now its time to send him a verbal message in deer language. Again, to keep the setup as natural as possible, match the call to the decoy and scent as well as the time of the year. You wont find a buck running rampant grunting a tending call throughout the season so pay particular attention to all pre and post-rut activity and adjust accordingly. A suggestion would be to refrain from calling right after you’ve made your setup. Wait a minimum of 30 minutes. Regardless of all your efforts to control and mask your scent, you’ve probably left some residual odor around the immediate area. With a short wait you’ll find that your scent has dissipated and the scent used for the decoy has begun to overwhelm the area. Use your typical calling sequences when trying to attract a deer to your setup but once again refrain from calling when a deer gets into closer range. Remember, you’ll be set up about 30 yards from your decoy and a call at close range may ruin all your hard work and efforts. Keep the calling to a minimum preferably using a sequence of calls every 30 minutes. The setup outlined above is a great way to attract, study reaction, and harvest deer but you can take this one step further to create an extraordinary means of attracting deer. Although this method requires more time, resources, money, and probably the help of a good friend, the end result can be phemonal. For those who have more than one target or decoy, an array of scents, and several different calls, this will be easier to apply as we create the scene of a bedded doe and a tending buck with possibly one smaller buck as an onlooker waiting for his opportunity to come in and spoil the day. Start with your bedded doe decoy using the same format described above and use a doe in estrus scent for that decoy. Your second decoy, a larger buck, should be positioned standing behind the bedded doe. 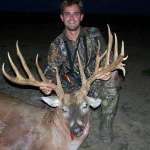 Any type of rutting buck lure, such as a tarsal gland, can be used here for this buck. A third buck decoy, smaller than the first, would be placed more towards your treestand but yet visible to the first two decoys. He should also be used in configuration with a rutting scent. The calls would consist of a doe bleat, a tending grunt, and an adjustable grunt tube. The adjustable grunt tube should be used to make a higher, less throaty, grunt than that of the bigger buck. This will all entail a lot of work and more movement to work utilize more than one call so as we suggested earlier, a friend is a wise choice to put this technique to work. The key to making this setup work is more than just creating the scene. Your choice of antler size for the decoys also plays a big role. Personally I wouldn’t use a big set of antlers on my decoys but rather something slightly less than that of the deer I am looking to harvest or what has been known to travel this area but certainly don’t be surprised if a little guy wanders in for a look. Keep in mind that during the rut deer travel great distances in search of a hot doe so a heavier application of estrus for the doe is vital to prevent the buck scents from over-powering the immediate area. This setup, along with some well managed calling sequences, can bring a buck in from a great distance when executed properly, at the right time of the year. DeerFever does not recommend the use of decoys on public hunting grounds! Decoying deer is best suited for personal properties that are well posted against trespassing with some inside knowledge of where the neighboring hunters will be posted. We also recommend that when transporting decoys they are always wrapped with a high visibility hunters orange. Walking through the woods in full camo with a deer decoy on your back just is not a good idea regardless of where you are hunting. Keep it safe and mark each decoy from all sides!